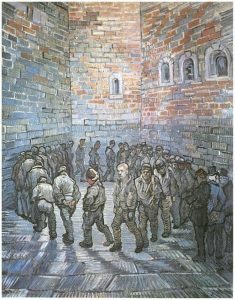 Vincent van Gogh painted Prisoners Exercising, or Prisoners’ Round, in February of 1890 during his time at the Saint-Remy asylum. It is a copy of an engraving by Gustave Dore titled, Newgate Exercise Yard which offers a glimpse into prison life as inmates slowly march in a circle for exercise in the prison yard, surrounded by walls that seem to go up forever. While in the asylum, Van Gogh copied a number of paintings by other artists. Prisoners Exercising is considered by some to be one of the best copies he created, perhaps even outshining the original artist. Next Post Next post: How Did Vincent van Gogh Die?